Enter the Saturn wine glass. According to the creators at Superduper Studio, they used a variation of a traditional Italian glassblowing technique that makes the glasses surprisingly light and stable, even when filled with liquid and knocked akimbo. Check out the video below. The glasses are handblown and rumored to be very sturdy. Food and Wine points out that not only are these glasses great for preventing spills, but they can take care of aereation, too. Be warned, though: these babies cost $52 per glass. If you've got that kind of scratch, more power to you. If, however, you're on a budget, you might want to check out these Sempli wine glasses at $25 a pop, which have a similar tilt and rotation effect as the Saturn wine glass (although they don't purport to be spill-proof). Hey, there's a matching decanter, too. Truthfully, these Sagaform rocking whiskey glasses are the ones I'm most likely to buy until my Lotto-winning dreams come true. 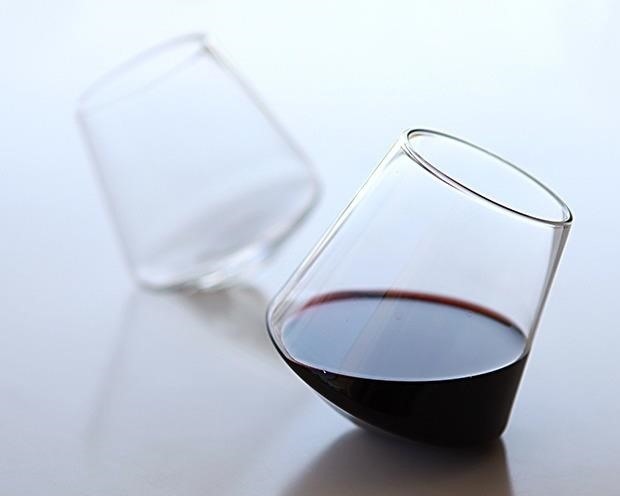 At $24.95 for six glasses, they're a bargain and they're designed to stay upright, too. I plan on using mine with wine, which probably violates all kinds of drinking rules, but I'm willing to take that chance (especially if it leaves my rugs stain-free). Want to keep your liquor chilled without watering it down? Then you need to get some whisky stones. This portable growler and kegulator let you bring fresh-from-the-tap beer with you wherever you go. After all that drinking, you'll want a cup of coffee, which is why you should get a Turkish ibrik: it's the easiest and cheapest way to make the best-tasting coffee in your own home.